In April, Nokia announced plans to acquire Alcatel-Lucent in a deal valued at $16.6 billion. At the same time, the company announced plans to divest its mapping division, which operates under the HERE brand. In recent days, media reports have indicated that Nokia may well hold on to the mapping division, while most recently, Uber announced a $3 billion bid for HERE. Envision IP took a close look at Nokia’s mapping and location-based services patents to understand what Uber, and other possible bidders, stand to gain from a patent standpoint. It is first helpful to understand how Nokia became a leader in the mapping space however. The company made a series of acquisitions in the mid-2000’s, first by purchasing a route planning software company called Gate 5 in 2006, and subsequently acquiring Navteq in 2007. The Navteq acquisition cost Nokia $8.1 billion, and gave Nokia a strong presence in the automotive navigation and mapping data space. Following the Navteq acquisition, Nokia purchased the social networking site Plazes, mobile application developer Bit-Side, social location platform Plum, social travel service Doppler, local search service Metacarta, and street level 3D capture technology EarthMine. The cumulative effect of these varied acquisitions has positioned Nokia’s HERE division as a leader not only in the automotive navigation space, but also a powerful mobile digital mapping platform that integrates with social networks and search engines, and helps to provide localized, targeted content to end-users. As a result of the Navteq acquisition, Nokia currently owns over 400 US patents stemming from Navteq’s geographic information systems and electronic mapping technologies. These patents are assigned to Nokia’s subsidiary HERE Global B.V. The HERE Global patents include an impressive mix of legacy and fundamental patents originally filed for by Navteq, as well as more recent issuances that complement car-service technologies. For example, US 9,020,754 entitled “Vehicle arrival prediction”, US 8,909,476 entitled “Method and apparatus for recommending content based on a travel route”, and US 8,898,010 entitled “Deviation detection in mobile transit systems” may all appeal to Uber. Other patents which seem very relevant to today’s market cover determining and displaying traffic conditions, providing paid advertising along with traffic alerts, various route guidance methods, and search engine technologies for geographic, voice, and text-based location and point-of-interest searching. Many of the Navteq patents date back to the late 1990s and early 2000s, and have relatively high forward citation counts of over 200. This indicates that these Navteq patents may be fairly fundamental to the navigation space. As Envision IP reported last March, the lack of patents is consistent across the car-service industry. An acquisition by Uber would certainly give the company a strong competitive edge in terms of patent protection and potentially blocking competitors and new entrants. In addition, the Navteq patents would give Uber significant patent rights in the automotive navigation space. In addition, Nokia picked up a small portfolio of 9 US patents when it acquired Metacarta. These patents relate to search technologies, result ranking algorithms, and user interfaces for geographic-based search and retrieval systems. 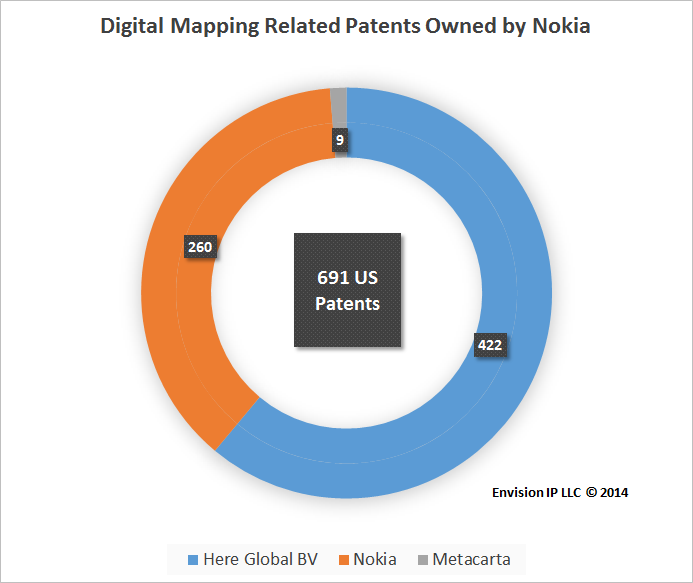 Nokia itself developed and acquired 260 US patents related to location-based and mapping technologies outside of the Navteq acquisition. Interestingly, Alcatel-Lucent also has a small portfolio of about 150 US patents related to navigation-related technologies. A deal involving HERE could possibly include these ALU patents depending on the timing of when each transaction closes. In total, the approximately 700 US patents related to its HERE division that Nokia owns represents approximately 8% of the company’s entire US patent portfolio of 8,446 patents. However, Uber is not the only company that has expressed interest in the HERE division. The New York Times reported that a consortium of German automakers including BMW, Audi, and Mercedes-Benz may also be working on a bid in collaboration with the Chinese search engine Baidu. This is not surprising, given that the Navteq patent portfolio is heavily focused on automotive navigation technologies. Ultimately, it appears that a car-service provider like Uber, or an automotive manufacturer may be best positioned to commercialize the HERE patent portfolio. However, it would not be surprising if Google, Facebook, or Apple, companies that are constantly innovating and looking toward strategic acquisitions, seek to purchase these patents to complement their own existing mapping and location-based technologies (note: Facebook recently began to integrate HERE mapping with its platform).